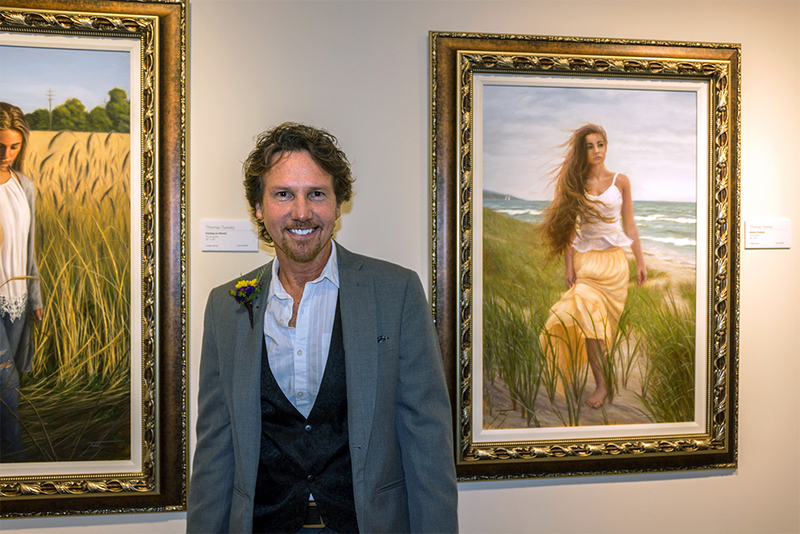 Commerce Township artist Thomas Tunney was named 2017’s winner of the MI Great Artist competition October 25th at the Park West Gallery in Southfield. The gallery’s mood was festive as art enthusiasts from throughout Oakland County gathered to celebrate Tunney and his fellow finalists. 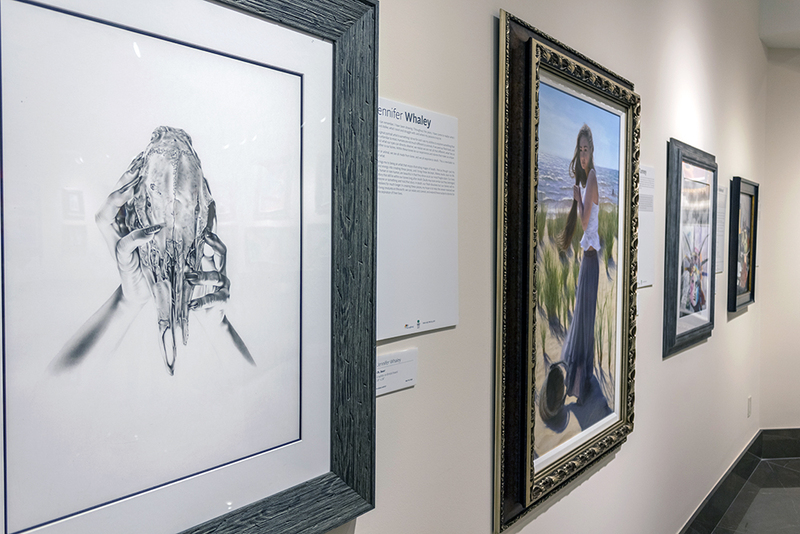 Event focal points included a shared exhibition of artistic works by the finalists, and a solo exhibition for the 2015 MI Great Artist Ken Hershenson. The finalists were chosen from a field of 232 artists from Oakland, Lapeer, Livingston, Macomb, St. Clair, Shiawassee and Wayne counties who entered the online competition in July in hopes their entries would catch the discerning eye of the public. After 34,000 online votes were cast during two weeks the field was whittled down in August to 20 artists. A panel of art experts selected the five finalists and ultimately chose the winner. As the main event began, the crowd, which included the finalists’ friends and family, convened around the speaker’s podium to hear remarks from Oakland County Executive L. Brooks Patterson, Deputy County Executive Matthew Gibb, and Park West CEO and founder Albert Scaglione. In his opening words, Patterson acknowledged the exponential growth in size and quality of the MI Great Artist program since its inaugural year in 2012. Following Patterson’s remarks, Scaglione reflected upon the cultural role of Southeast Michigan and its place in his own life. Scaglione, a New Jersey native, first moved to Michigan over four decades ago. “To move to Michigan, for me, was the best decision I’ve ever made in my life,” he said. Deputy County Executive Gibb agreed with Scaglione, noting that Oakland County’s cultural vibrancy pays dividends to the local economy. “What they tell us most when companies move here is: ‘yeah it’s a great business climate, but the quality of life, the people, and the culture that’s here in Oakland County is what we really sell,’” Gibb said. When Gibb ultimately announced Thomas Tunney as the winner, the room erupted into applause. As he took the stage, Tunney expressed surprise, excitement, and respect for his fellow finalists. Reflecting on his win later in the night, Tunney grew introspective. This year’s MI Great Artist competition marked several firsts for Tunney, who had never before entered his work in competition or displayed it publicly. Tunney’s winnings include five submitted artworks framed by Park West Gallery; a group exhibition at Park West Gallery; business counseling and other services from the Oakland County One Stop Shop Business Center; his artwork featured on a poster to promote one of Oakland County’s signature quality of life events; a solo exhibition at Park West Gallery; and a two-month solo exhibition at the Oakland County Galleria in the Executive Office Building in Waterford. Each received a $375 cash prize, framing of five artworks by Park West Gallery, a group exhibition and a suite of business services from the Oakland County One Stop Shop Business Center. Be sure to keep in touch with MI Great Artist year-round by visiting their website and liking them on Facebook. This is awesome! Wish we could’ve been there.